If you have photo prints that you want to edit in Photoshop Elements, you can use a scanner to import them into the program. Scanners connect through the same ports as cameras and card readers. Typically, you use either a USB or FireWire port. Most low-end scanners sold now are USB devices. Connect the scanner properly. Make sure that you have all connections made to your computer according to the user manual that came with your scanner. Clean the scanner platen. Use a lint-free cloth and glass cleaner (applied to the cloth) to remove all dust and particles on the glass. Clean the source material. Be certain that the print or film you want to scan is free of dust and spots. Get to know your scanner software. 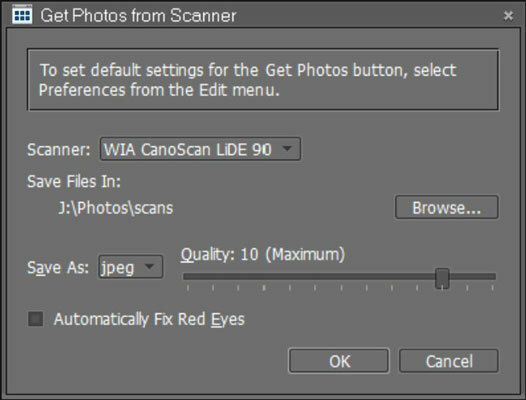 When you scan in Elements, the software supplied with your scanner takes charge, and you use the options in this software before it finally drops into an Elements image window. Prepare the artwork. If you plan on scanning pages in a book or pamphlet, remove the pages or try to make photocopies so that the piece you scan lies flat on the scanner platen. Make sure that you observe copyright laws if you’re scanning printed works. After installing a new scanner and the accompanying software, launch Elements and then open the Organizer by clicking Organize on the Welcome screen. From the Organizer, open the Preferences dialog box by pressing Ctrl+K. Click Scanner in the left column and adjust the Scanner preferences. To open the scanner software from within Elements, choose File→Get Photos and Videos→From Scanner. You must be in the Organizer window on Windows to access the File→Get Photos and Videos→From Scanner menu command. In the Get Photos from Scanner dialog box that appears, make your choices and click OK. Here you make a choice for your scanner in the Scanner drop-down menu, a location on your hard drive for saving the scanned images, a quality setting, and an option to automatically correct red-eye. Make choices in the Get Photos from Scanner dialog box and click OK. When you scan from within Elements, your scanner software loads on top of the Elements workspace. Regardless of which software you use, you should have similar options for creating a preview; selecting resolution, color mode, and image size; scaling; and other options. If you click the Preview button, you see a preview before scanning the photo(s). Adjust the options according to your output requirements and the recommendations made by your scanner manufacturer. When everything is ready to go, click the Scan button. The final image drops into an Elements image window. Photoshop Elements doesn’t support scanning on the Macintosh as it does for Windows. On the Mac, you have a few different options. 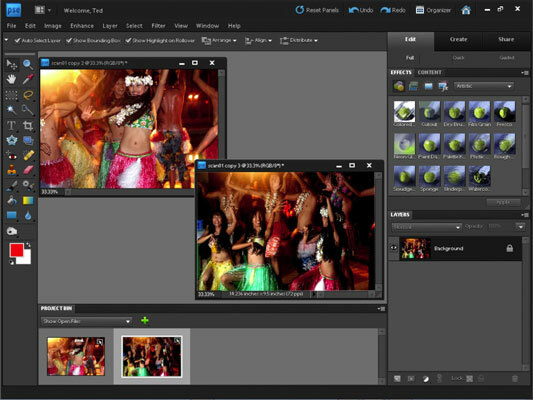 You can use your scanner software and open the resultant scan in the Elements Editor, or you can use Image Capture. With Image Capture, you can complete a scan and open the file directly in Elements without having to first save the scan to disk. If you have several photos to scan, you can lay them out on the scanner platen and perform a single scan to acquire all images in one pass. Arrange the photos to scan on the glass and set up all the options in the scanner window for your intended output. When you scan multiple images, they form a single scan. After you scan multiple images, Elements makes it easy for you to separate each image into its own image window, where you can save the images as separate files. In Edit Full mode, choose Image→Divide Scanned Photos to make Elements magically open each image in a separate window while your original scan remains intact. The images are neatly tucked away in the Project Bin, where you can select them for editing. 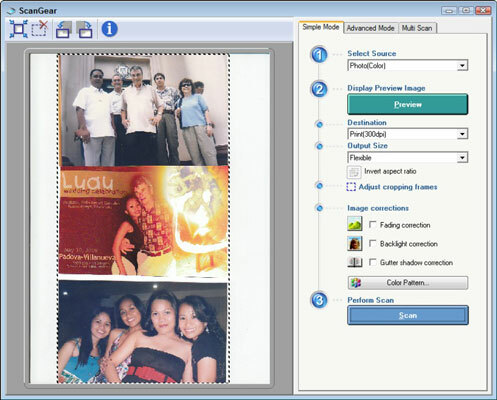 After you choose Image–>Divide Scanned Photos, the scan is split into separate image windows.